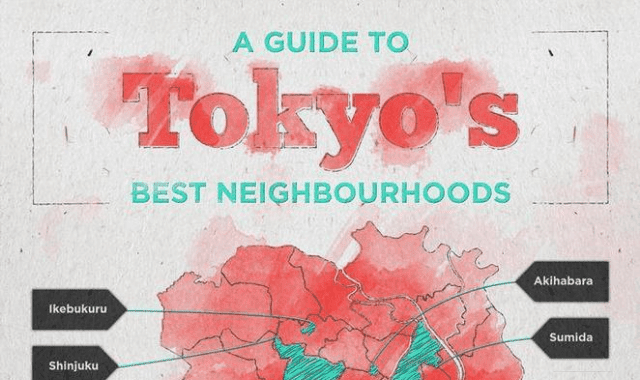 A Guide to Tokyo’s Neighbourhoods #Infographic ~ Visualistan '+g+"
The Japanese capital has long been associated with crazy culture, kaleidoscopic colors and cutesy Kawaii. From the buzzing streets of Harajuku, littered with self-proclaimed fashionistas, to the cherry blossom strewn rivers, everyone has a preconceived image of Tokyo in their heads, and, largely speaking, it’s usually pretty accurate. As familiar as the city’s character is though, considering its size and patchwork of districts, there’s an awful lot to discover beyond the obvious, flashy personality. Aside from being one of the world’s top shopping destinations and a real, quirky fashion capital, Tokyo is covered with ornate shrines and edifying museums just waiting to be explored and discovered. And that’s not even mentioning the incredible gastronomic explosion that characterises the city’s foodie scene, from the unbelievable array of street-food favorites like bento and sashimi to some of the most glitteringly chic restaurants in Asia. Combine that with Tokyo’s completely unique, edgy and sometimes downright bizarre personality, and a more exciting city you couldn’t discover. Below is an infographic detailing its best neighbourhoods, as well as the best cultural sites, eateries, shopping streets and iconic landmarks that you can expect to find in each - if you haven’t yet, it’s definitely time to Toky-go!